[139 Pages Report] The growth of the global transparent caching market is driven by various factors, such as need of reduction in cost of network infrastructure and need for improved network bandwidth. The increased problems of the network congestion can be tackled with the help of transparent caching solutions Installation of caches across the network can help service providers to offer popular content on the network, thereby reducing the amount of traffic across the network. Bandwidth plays an important role in business profitability while working on improving the user experience. Service providers are getting advantage from transparent caching technology by saving the bandwidth cost. The global transparent caching market is expected to grow from USD 876.6 Million in 2017 to USD 4,274.2 Million by 2022, at a Compound Annual Growth Rate (CAGR) of 37.28%. The base year considered for the study is 2016, while the forecast period is 2017–2022. The objective of the report is to define, describe, and forecast the size of the transparent caching market on the basis of content type (live streaming video, static videos, and others), software (policy management, security, and analytics), hardware (converged server and switches), services (professional and managed), end-user (ISPs, telecom operators, direct-to-home (DTH) Cable service Providers, enterprises, governments, and others), and regions. The report also aims to provide detailed information about the major factors influencing the growth of the transparent caching market (drivers, restraints, opportunities, and challenges). 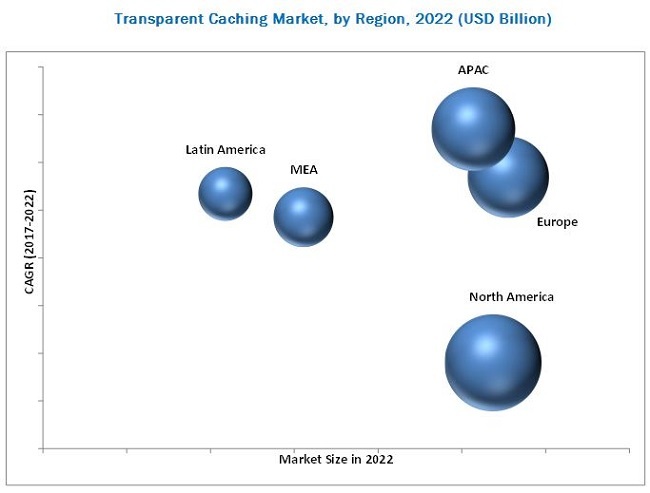 Major vendors in the transparent caching market are Cisco Systems, Inc. (California, US), Ericsson AB (Stockholm, Sweden), Google (California, US), Qwilt (California, US), Symantec Corporation (California, US), Nokia Corporation (UuSimaa, Finland), ARA Networks (Seoul, Korea), SuperLumin (Dayton, Ohio), Kollective Technology, Inc. (California, US), Fortinet, Inc. (California, US), Akamai Technologies, Inc. (Massachusetts, US), Brocade Communications System, Inc. (California, US), Level 3 Communications, LLC (Colorado, US), Citrix Systems, Inc. (Florida, US), and Huawei Technologies Co., Ltd (Shenzhen, China). The global transparent caching market is expected to grow from USD 876.6 Million in 2017 to USD 4,274.2 Million by 2022, at a Compound Annual Growth Rate (CAGR) of 37.28%. The major growth drivers of the transparent caching market include the rising subscribers’ demand for superior Quality of Experience (QoE), the need for reduction in cost of the network infrastructure, and the need for a bandwidth. In the content type segment, the static videos segment is expected to have the largest market share during the forecast period. The online video traffic occupies much of the internet bandwidth, due to which, the carriers feel more pressure. The transparent caching solutions caches the content, based on its popularity over the network. The cached content can then be delivered locally to the subscriber from the operator’s network rather than retrieving it each time from a distant content source, thus improving the QoE for users while watching online videos. Under the hardware segment, the converged server segment is expected to grow at a higher CAGR and projected to have the largest market than that of the switches segment during forecasted period. Lots of cached file can be stored on the disk due to frequent Hypertext Transfer Protocol (HTTP) and Peer-to-Peer (P2P) cache. Users may not access the cached files on the disks regularly. With the advanced transparent caching solutions and disk recycling technology, the cache system utilizes and controls a huge disk space. In the software segment, the security segment is expected to grow at a higher CAGR during forecast period. Transparent caching offers advanced security solutions to attain security goals. Caching software takes advantage of advanced features, including safe search enforcement and keyword filtering, and provides the web filtering solution, which simplifies the management of controlling the access to websites. The professional services segment is expected to grow with the highest CAGR and have the largest market share during the forecast year. The professional service providers analyze the network traffic and service types, hit rates, deployment locations, redundancy and service availabilities, and business constraints and regulatory requirements. The professional service providers also provide major insights into professional services, which helps Internet Service Providers (ISPs) to deploy transparent caching solutions securely and accelerate business operations. The telecom operators segment is expected to grow at the highest CAGR during the forecast year. Transparent caching allows telecom operators to handle the Over-the-Top (OTT) content consumption and offer enhanced QoE to the subscribers. The global transparent caching market has been segmented on the basis of regions into North America, Europe, Asia Pacific (APAC), Middle East and Africa (MEA), and Latin America. North America is estimated to be the largest revenue-generating region. This is mainly because, in the developed economies of the US and Canada, there is a high focus on innovations obtained from R&D. These regions have the most competitive and rapidly changing market in the world. The APAC region is expected to be the fastest-growing region in the transparent caching market. The increased awareness for business productivity, supplemented with competently designed transparent caching solutions offered by vendors present in the APAC region has led APAC to become a highly potential market. The transparent caching market faces many challenges, such as security concerns and insufficient investment in the transportation infrastructure. The major vendors that offer transparent caching solutions across the globe are Cisco Systems, Inc. (California, US), Ericsson AB (Stockholm, Sweden), Google (California, US), Qwilt (California, US), Symantec Corporation (California, US), Nokia Corporation (Uusimaa, Finland), Ara Networks (Seoul, Korea), Superlumin (Dayton, Ohio), Kollective Technology, Inc. (California, US), Fortinet, Inc. (California, US), Akamai Technologies, Inc. (Massachusetts, US), Brocade Communications System, Inc. (California, US), Level 3 Communications, LLC (Colorado, US), Citrix Systems, Inc. (Florida, US), and Huawei Technologies Co., Ltd (Shenzhen, China). 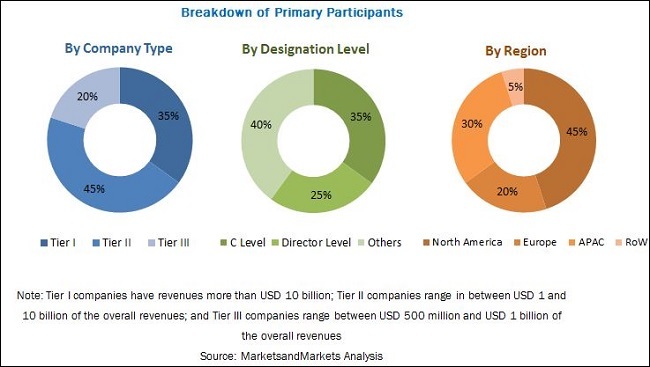 These vendors have adopted various types of organic and inorganic growth strategies, such as new product launches, partnerships and collaborations, and mergers and acquisitions, to expand their presence in the transparent caching market. 13.12 Brocade Communications Systems, Inc.
13.15 Huawei Technologies Co., Ltd.